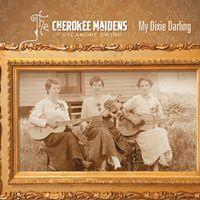 The Cherokee Maidens have returned with a new album, My Dixie Darling. Cherokee Maidens’ founding member Robin Macy says there’s something very important that’s informed the music this time out. “This record is all about bloodlines,” she says. Joining Macy, fellow Maiden Monica Taylor and guitarist Ken “Kentucky” White is a new voice. At the core of Sycamore Swing, which backs the Maidens, is fiddle player Shelby Eicher, known for his work with the Tulsa Playboys. Bloodlines also found their way into some of the material, including the song "Rock City Boogie." The 1951 piece from Anita Kerr and Jerry Allison has been recorded a number of times, including by Billy Jack Wills, brother of Bob Wills. Tennessee Ernie Ford also cut a version of the tune, backed by The Dinning Sisters. Macy wanted a male vocalist to play the Wills/Ford role in the Maidens’ version of the song. She asked Asleep At The Wheel vocalist Ray Benson to add his talents to the song. “Sure shootin’ he was happy to accommodate us,” she says. The singing is one part of The Cherokee Maidens. Another is Shelby Eicher's musical arrangements and, finally, Kentucky White's guitar playing and production touches. Macy struggles a little in her praise for the fellow musician, though not without reason. The Cherokee Maidens celebrate the release of My Dixie Darling this Friday at Roxy's Downtown and Monday, May 29 at the Bartlett Arboretum in Belle Plaine. Cherokee Maidens is a trio focused on the pristine harmonies of Western swing music but band co-founder Robin Macy says the trio’s debut album is about so much more.